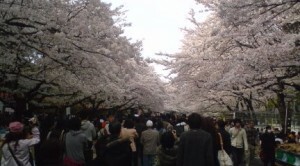 If you are in Japan during early April (and this year in late march), you will certainly hear a lot about, and most probably even be invited to- HANAMI, which is usually translated as CHERRY BLOSSOM VIEWING. Unfortunately, this English description does absolutely no justice to the UNIQUE way in which the Japanese celebrate the full flowering of the sakura (cherry) trees. For while you might well have seen people enjoy the VIEWING of flowers or blossoms in other countries, or even watched Japanese people admiring OTHER popular flowers in Japan itself, nothing will have prepared you for the crowds, solemnity, excitement, ribaldry, and the INTENSITY OF GAZE, that you will find at so-called cherry blossom viewing parties, especially at Japan’s famous HANAMI spots. Most of this is done by revellers who are not just strolling casually by, but who have spread their sheets under the blooming trees and have brought sufficient food and drink. There is singing and maybe dancing, which more often than not is fuelled by alcohol. The blossom viewing itself is not only done from a distance, but also from way up close, as some of the small blossoms are examined and photographed carefully and individually. 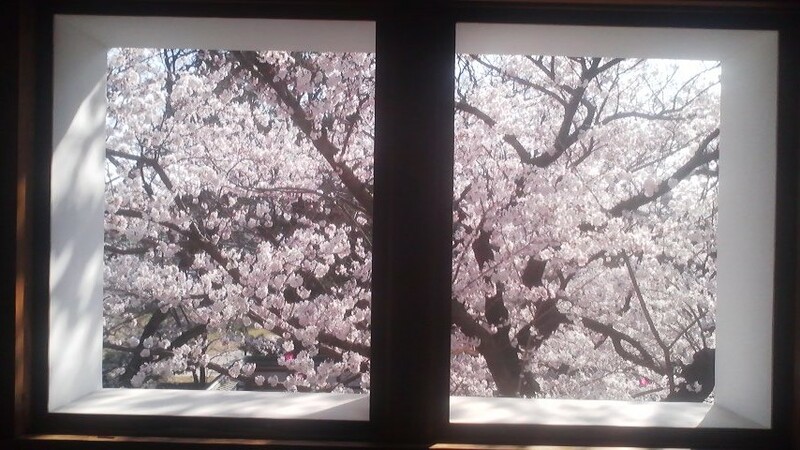 Hanami is NOT the mere viewing and enjoyment of beautiful flora. It can neither be said to be just a celebration of spring (though it is that as well). It is something moving and spiritual, with deep and ancient connections not only to Japanese history, as is often written about in English, but even more importantly, to folk beliefs (a point which is hardly touched upon in non-Japanese language sources). I think that we can more fully UNDERSTAND and appreciate the experience of HANAMI, if we look at the etymology (origin) of the Japanese word SAKURA. I have found several Japanese language sources explaining that the SA of sakura derives from SA NO KAMI (田の神) or SAGAMI (田神), which is the traditional God of the Rice Fields. The KURA that makes up the rest of the word is from KURA, meaning seat, storehouse or vessel. In other words, SAKURA originally meant SEAT OF THE GOD OF THE RICE FIELDS. 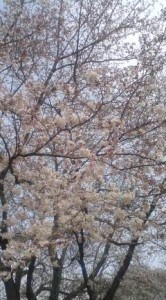 This is understandable, since the cherry trees, which in ancient times grew wild throughout Japan, bloom just before the farmers would begin the annual cycle of rice production. This synchronicity linked the blossoms and the onset of cultivation in the minds of the people. 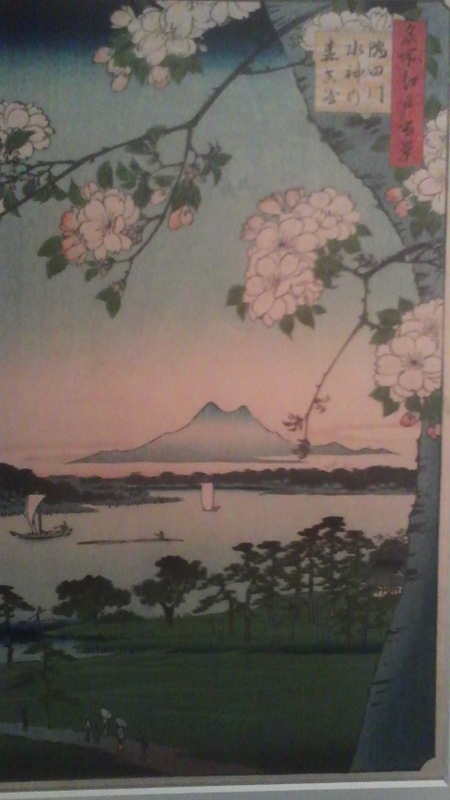 For the farmers, who believed that after the rice harvest in autumn the God Of the Rice Fields would retreat to the mountains only to return once again in spring, the blossoms of the cherry trees were a physical manifestation of the returning God. When full bloom was reached the farmers would entertain the God with feasting, singing, dancing, revelry, and drinking (even in contemporary Shinto, the Gods are often entertained by music and dances -KAGURA- and offered food and drink. Lewd dancing is also an accepted way of enertaining the Gods, as the Sun Goddess herself, Amaterasu, was drawn out of hiding by such entertainment- see Japan`s oldest extant text, The Kojiki). Being that the blossoms were believed to be divine , the energies emitted by the blossoms at the full-bloom point were also considered to be an elixir. The farmers would also DIVINE (predict) the result of the next harvest by carefully and closely examining the sakura blossoms` petals. This is STILL done in some areas. When the blossoms had fallen completely it was a signal for the farmers that it was time to get to work. In these ancient practices we can find all the components of contemporary HANAMI: the (sometimes raucous) partying under the blossoming trees, the careful examination of the blossoms, and the sense of reverence. We can now also understand why, in a culture which has been so strongly connected to the agricultural cycle, the SAKURA trees would have a special place among all other flowers and trees. English language sources often suggest that because certain Japanese Emperors, especially the Emperor Saga, held elaborate and memorable HANAMI events that such a custom eventually became established among the people. Well, the Japanese folk certainly do have a tendency to try and emulate the culture of the aristocracy and the ruling class. 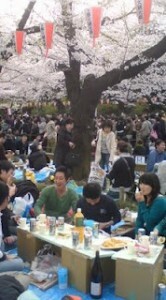 However, this explanation fails to explain why the Emperors would have held these huge hanami gatherings. For me it seems natural that the Emperors of Japan, who are also the HEAD PRIESTS OF THE NATION whose role it is to pray for abundant harvests, were merely doing what Japanese rice farmers had done since time immemorial- entertain the god which was manifest in the cherry blossoms. 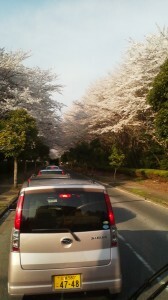 I think in the case of HANAMI that it was the Emperors taking on the customs of the common folk. 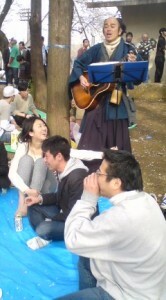 Some foreign language sources also attribute Chinese origins to HANAMI. It is often explained how in the Nara Period, when Japan was indiscriminantly adopting any aspect of Chinese culture they knew of, the Imperial Palace highlighted the plum (ume) tree, the most prestigious blossoms of the Chinese Court. 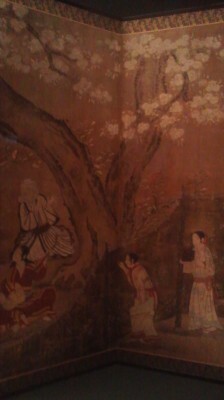 The oldest collection of Japanese poems (The Manyoshu), also had many more poems about plum blossoms than sakura. This was of course was due to Chinese influence. However, one point that is never mentioned in regard to this is that though the Chinese appreciate the beauty of nature, they never celebrated any of their favorite flowers the way the Japanese did the sakura. And though due to their prestige in China, plum blossoms were highly regarded as an ornament for the palace and a subject of poetry, they were never treated with anything like the Japanese Hanami rituals. These same sources explain how, later in the Heian Period, when the Japanese were more confident to assert their own roots, how the sakura became the most respected tree at The Court because many cherry trees bloomed in the mountains around the new capital at Heian-Kyo (kyoto). 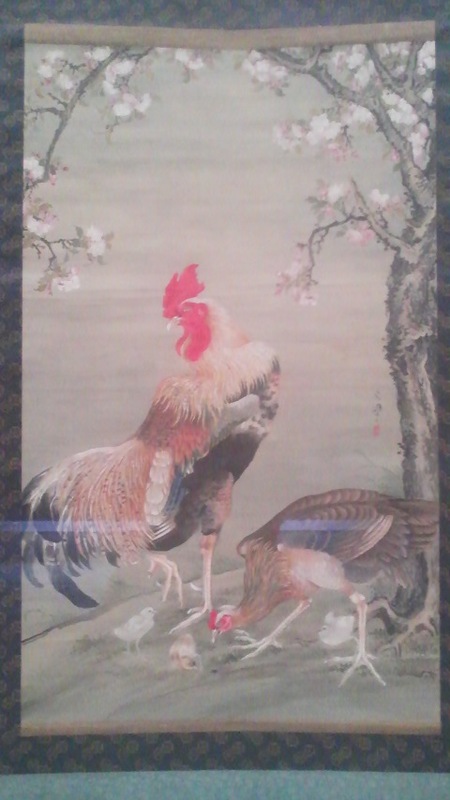 I think that what really happened was, that for a period, when Chinese influence was at its strongest in the Nara Period at the old Heijo-kyo capital, the Japanese elite considered the sakura, which had always been and still was the tree closest to hearts of the people, to be provincial and unsophisticated. Later, when the capital was moved and the Japanese began to gain more confidence in their own traditions, the sakura was returned to its place of prestige even at the Palace and in the poetry books. Another episode in the history of Cherry Blossom culture also helps illustrate, I believe its connection to the common folk. One of the great HANAMI parties of all time was held in the late 16th century by the great warrior, and one of the unifiers of Japan- Hideyoshi Toyotomi- who not surprisingly based on what I have already told you, was of common origin. I do not mean to assert here that The Japanese today are conscious of the spiritual roots of Hanami which I have descibed in this article. I do believe though, that all the ancient forms, and an unspecified sense of spiritual significance have been passed down through the centuries and live on today. It is also important to note that in contemporary Japan, the cherry blossoms still signify new beginnings — the new school year, fiscal year, etc. — just as for the majority of the population throughout Japanese history, the cherry blossoms signaled the start of the work year, the work of producing rice. 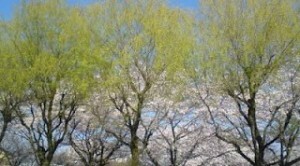 If you have a chance to do Hanami while you are in Japan- DO NOT HESITATE- it is a UNIQUE JAPANESE EXPERIENCE! Take it all in! Onabake Jinja`s Hatsu-uma Festival Features a Lively Traditional Market (this year on March 23rd)- and an interesting history! 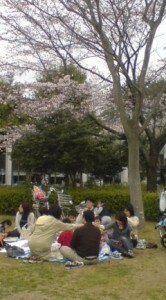 Turned on the TV this morning and found out the cherry blossoms in Ueno Park are in full-bloom. on the large crowds and the large number of foreigners (with the obigatory scenes of non-Japanese breaking various rules. Based on what I saw, with all the the people for the cherries and the crowd lined up outside the zoo waiting for their chance to see the baby panda, I would say that if you planning to go to Ueno – and you SHOULD if you want to see what the real HANAMI atmosphere is like – you should go at night – when there will be less tourists, less non-hanami visitors, and much more reverly! 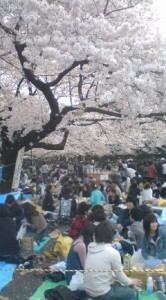 The only drwback is that you will probably not be able to actually DO hanami, which involves sitting down and eating and drinking under the trees (since all the spots will have been taken up)- but you will be able to walk around and observe the raucous goings-on. 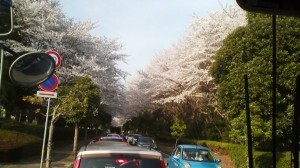 You can have a hanami of your on, at leisure, next week in Tsukuba.